Pope Francis has been popping up all over the northeastern United States ahead of his visit next week. Here’s how the country has been preparing for the pontiff’s visit to Washington, New York and Philadelphia, which kicks off tomorrow. 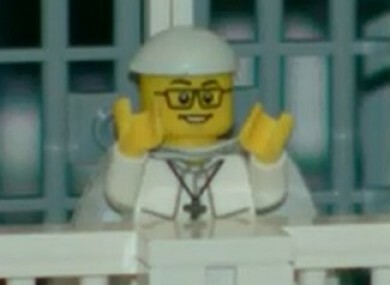 A priest in Pennsylvania is building a replica of St. Peter’s Basilica out of Lego blocks in honor of Pope Francis’s visit. Father Bob Simon of Saint Catherine of Siena parish in Moscow, Pennsylvania, has used half a million blocks to produce a scaled-down version of the Vatican City basilica and its adjoining colonnaded piazza. Six months in the making, the work will be on show from today until February 15 at the Franklin Institute Science Museum in Philadelphia, near where the pope will attend the World Meeting of Families event. A figurine will represent Father Simon in “contemplation” before the Vatican, which he has visited five times, according to the Franklin Institute. You can toast the pope’s visit in a whole new way with the “Pope Toaster”, which brands Francis’s image onto a slice of bread. For a spot of variety at breakfast, it can also print the words “Spread the Love”, images of Philadelphia icons Ben Franklin or the Liberty Bell. Billed as the “best thing since sliced bread” the Pope Toaster will set you back about $50. A cardboard cut-out representing Pope Francis has been cropping up all over Philadelphia, snapped in selfies by Catholic fans across the city. Appearances of the “pop-up” pope can be followed on social media under the hashtag #popuppope or on the Twitter account @PopUpPope. The cardboard likeness is being used to evangelize and spread news about the real-life Francis’ visit, says the account. Diehard Francis fans will be able to follow every minute of his trip on at least two dedicated television stations. Cable provider Time Warner is providing 24-hour coverage of the pope’s speeches, masses and visits on a special “Papal Visit 2015″ channel, also accessible online or through their TWC News app. Its coverage is likely to be more secular than that of Catholic network EWTN (Eternal World Television Network), which is also carrying live broadcasts. Aretha Franklin will perform for the pope at the World Meeting of Families event in Philadelphia – and the pontiff is expected to give 28 speeches during his Cuba-US visit. He’ll address a joint session of the US Congress on Thursday. The next morning, he’s set to give a speech in Spanish to the UN General Assembly. Originally posted Saturday. Reposted to coincide with the start of the papal visit, tomorrow. Email “US Catholics have been doing some strange things to prepare for the Pope's visit”. Feedback on “US Catholics have been doing some strange things to prepare for the Pope's visit”.